We saw earlier that to bind Grid.Row and Grid.Column properties on child items in an ItemsControl, we need to set up the binding on the ContentPresenter elements that contain the individual items. We can do this by overriding the ItemsControl.PrepareContainerForItemOverride method. This method is called for each item in the collection and receives both the containing element (a ContentPresenter in our case) and the contained item (a ChessPiece object in our example). 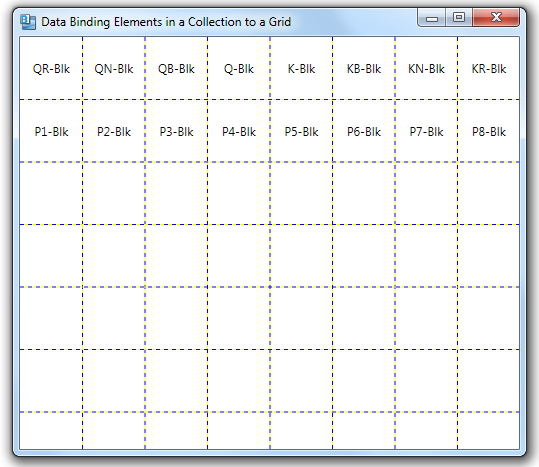 We bind the Grid.Row and Grid.Column properties on the ContentPresenter to the same properties on the contained item. Everything now works as expected. NOTE: Reader Bruno pointed out a much better way to do this, using the ItemContainerStyle property. What do you think about this aproach? Sure, if it works. Can you share an example? Please replace [ and ] for the correct syntax, this was the only way I could paste the code. Thanks Bruno! Using ItemContainerStyle is a much better approach, much cleaner. I wrote a new post explaining this method (will be published on 21Dec11) and updated this post to point to it. Thanks again!